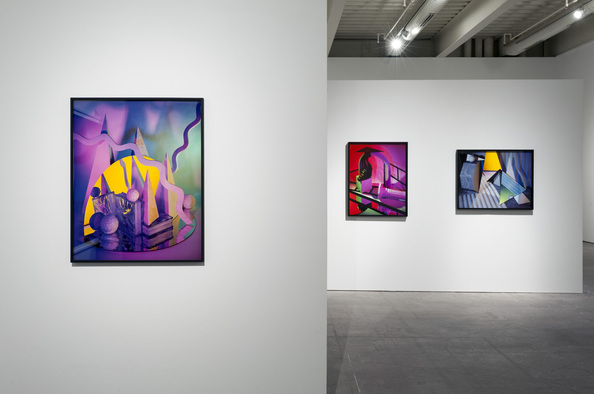 The ground floor galleries of the Institute of Contemporary Art currently house “Stages,” the first and sorely overdue survey of Barbara Kasten’s photography-based, multi-medium practice. As a prismatic allusion, the show’s title bundles the themes of the exhibition: the theatricality of Kasten’s expansive process, the iterations of her always playful engagement with surface and space, and the phases constituting her lengthy career. The show ties together some 50 years through roughly 80 works—predominantly photography, though video, installation, sculpture and painting are also represented—masterfully maintaining a visual density that alternately teases and rewards a curious eye. “Stages” contains a number of pieces from Kasten’s iconic photographic series “Constructs” (1979-86), displayed alongside examples from the more recent series “Studio Constructs” (begun in 2007). Both bodies of work involve a combination of performance and installation. For each piece, she placed a camera in front of an arrangement of objects in her studio, including handmade props in plaster and wood, and industrially manufactured items like mirrors, rods, and aluminum siding. Instead of manipulating the camera, she animated the grouping either by physically guiding the objects’ postures or by varying the light and color with gels or scrims. The resulting images are pleasurably disorienting. The coyly wavy line that slices diagonally across Construct XXVII (1984) does not immediately yield its source (prop, texture, shadow? ), nor do the stacked peaks of black and white triangles (reflection, light, pigment?) in Studio Construct 8 (2007). Strong and nuanced exemplars of Kasten’s pictorial grammar, the two series destabilize our assumptions about the visual properties of mass and light, reflectiveness and transparency, surface and edge—all the while indulging in the expressive potential of these qualities. The highlight and thematic spine of the show is the aptly named video installation Axis (2015), an ICA commission, which is 30 feet tall and projected into the corner of a gallery. Here, white geometric shapes—a pyramid, a cube or stacked cubes—rotate around an axis that aligns with the corner seam. There is an elegantly simple optical illusion at play: the shapes distort as they turn, their faces stretching and receding along the adjacent walls. Axis thus makes its viewer a witness to the beautiful slippage between opposites, a circumstance that underlies Kasten’s practice. This installation also functions as a formal and conceptual tether to other works on view. Its revolving motion is echoed in the video of a performance titled Inside/Outside: Stages of Light (1985), created in collaboration with the choreographer Margaret Jenkins, during which performers twirl around a geometric set built by Kasten. Axis also finds a sibling in Photogram Painting Untitled 77/22 (1977), a surprisingly sculptural, human-size photogram, which is divided into three sections and hinged to stand like a screen. Spatial contortions extend to the reflections and interruptions created by the mirrors Kasten uses in her photographs for the “Architectural Site” series (1986-90). The ultimate accomplishment of “Stages” is that it provides a narrative arc through Kasten’s career. Though she is best known for photography, she originally studied textile arts and painting, and the exhibition contains a cluster of her early works: creaturelike “Seated Form” sculptures (1971-72), in which chair frames are draped with colorful woven textiles, and “Photogenic Paintings” (1974-77), cyanotype contact prints bearing the impressions of flowing fabric. While this phase of Kasten’s career is sometimes considered a prologue to her photography, seeing these works in the presence of their later peers suggests otherwise. From the beginning, Kasten has been drawn to testing the corporeality of a plane and the witty errors of depth perception. “Stages” gives her the space to enunciate her contributions to larger interdisciplinary conversations and to demonstrate the internal continuity of her practice.